The Ballroom was as good as I was hoping it would be. Like Anna Hope’s first book Wake, the story is told through alternating narrators: Ella, John and Charles. Ella and John are both patients at the Sharston mental institution, neither of them ‘mad’ or ‘feeble-minded’. Just bad luck, really, has landed them there, at a time when bad luck or being born into the wrong circumstances is all you need to get yourself institutionalized. They fall in love during the Friday evening Ballroom dances, which brings hope back into their lives. Their love story is somewhat predictable, as many love stories are, but played out against the backdrop of an asylum in the early 1900s adds tension and interest. John sat himself in the corner and took small, shallow breaths, trying not to let it in; it was a terrible dangerous contagion, hope. I like the fact that Ella can’t read. Often, in historical fiction, we are reading about female characters who are educated, against the norm, and we admire them. But I’m sure there were many smart, strong women who didn’t have the opportunity to educate themselves or learn to read, and I appreciate the chance to read about, and admire, them as well. Ella knew about being good. Had known it since she was small. Being good was surviving. It was watching while your mother was beaten and staying quiet so you wouldn’t be next. Feeling sick because you were a coward and didn’t do more. Taking the blows once she had gone and never crying, or showing how much they hurt. Tucking in your plaits, shutting up and working hard. Day after day after day. Clem, Ella’s friend, adds more depth to the story. The doctors have a hard time figuring her out, but the readers are eventually let in on her story; how she came to be at the asylum and why she is not keen to be let out, despite the fact that she comes from a good family who seem to be very concerned about her progress. Charles is the character that I found most interesting. He joined on as one of the medical advisors at the asylum as a young man full of self-importance and the desire to show everyone how great he is. He becomes interested in Eugenics and, although he starts out optimistic about proving that pauperism is not hereditary, he eventually comes to believe sterilization is a good option for weeding out the ‘bad apples’. Charles becomes obsessed with getting Winston Churchill’s approval; he writes letters and dreams about a day when Churchill will come to the asylum and pat him on the back for all his good work. But the other interesting (and sad) thing about Charles is that he seems to be terrified of himself. He finds himself attracted to a man at the music store and it terrifies him, consumes him, and along with his obsession with greatness, he feels overwhelmed – showing the fine line between the people who have found themselves inside the asylum and the ones who are smugly on the outside. Ultimately this novel is about the importance of human connection for hope, happiness and survival in a world that can be dismal and cruel. How the beauty of life and the world struck him like a fever sometimes, but how it was all mixed up and mangled with the hate. As for the ending… there is something to be said for modern technology. *Thank you to Random House Canada for providing me with a copy of this book for review! 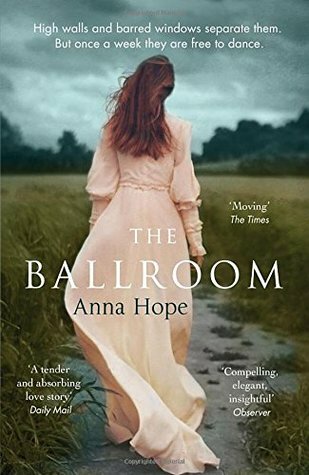 Further reading: Other blogger reviews of The Ballroom can be found at A Life in Books, The Writes of Woman, and Word by Word. If I’ve missed your review, just add a link in the comments! My review of Wake, which I also loved. Good review. I love books set in asylums especially in the past. From your review, it doesn’t sound too much like Bedlam. It’s on my list to read. Thanks. If you like reading about asylums, then you should like this book! Thanks so much for the link, Naomi. Very pleased to hear that The Ballroom didn’t disappoint. You’ve reminded me of just how much I enjoyed this compassionate, humane novel, made all the more poignant by Hope’s note that it was inspired by her great-grandfather’s story. I liked that aspect of it, as well, and I’m glad you mentioned it because I think I forgot to! I keep trying to decide which I liked most, but I just can’t. Yes, you had me at “mental institution.” 😉 I’m also intrigued by stories set in asylums. I will look this up! Me too! Another one I read last December, I think, is These Good Hands by Carol Bruneau – a book about the artist Camille Claudel – much of which was set in the mental institution she was confined to for the last 30 years of her life. 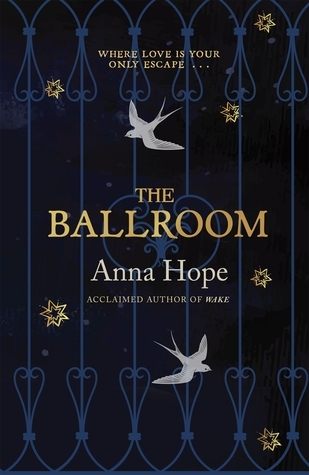 Great book – I read Wake last year and bought The Ballroom as soon as I finished Wake. Anna Hope’s characterisation and sense of place are spot on. I can’t wait to see what she writes next. Glad to know you liked them, too! I’ll be looking out for the next one! I’m so glad that you thought so well of this books – I loved it, and it was definitely one of the best new books I read last year. I’m so interested to see what Anna Hope writes next. I just saw it in your Box of Books (which I loved, btw – what a nice concept!). Let’s hope she keeps on writing! A love story set in an asylum in the 1900s…I’m intrigued. And I’m curious to see how Charles’s exploration of his sexuality is handled. Poor Charles – I felt so bad for him. He needed a friend! I’m so pleased this lived up to expectations! I’m really looking forward to reading it. Glad to hear it’s in your plans – I hope you like it as much as I did! Perfect! Another excellent Anna Hope novel. Thanks Naomi – superb review. Oh what a great review – and thank you! Timely reminder of one that slipped through the cracks for me last year and I must read it soon. Thank you, Poppy! I hope you get a chance to read it! I hate the cheesy tag line at the top of the third book cover, but the book sounds interesting. The characters are diverse, and I hadn’t considered literacy bring abnormal (which, of, course, more makes me feel dumb) because so many books set in the past DO have those strong, well-read women. The first two book covers are definitely better – the third one makes it look (and sound) like a romance novel (which it isn’t). However, I can see why readers who like romance novels might also like this book! I have loved the characters in both of her books. What made me think about Ella’s illiteracy was the fact that she herself is ashamed of it and doesn’t want John to know. It made me think about how many other women must also have been illiterate against their will – their lives just not allowing for the opportunity to learn to read (through no fault of their own, and not because they aren’t willing or capable). I love the first cover, and I think it fits best. The bars indicate the asylum, but the story also has fragments of beauty in the form of music, nature, and love. 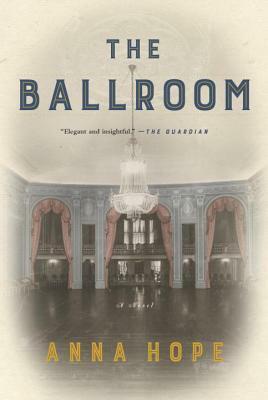 The ballroom itself is the setting for the meetings of Ella and John, but doesn’t make up a big part of the book. However, the ballroom of the institution that the author based the story on (Menston Asylum in West Yorkshire) is what inspired her to write this story. Wow that 3rd book cover is the best by far! The asylum & characters sound interesting …. The second one is kind of ‘blah’, though, isn’t it? Interesting point about characters who can’t read rarely getting time on the page: how ironic! Glad to hear that you enjoyed this one so much. If you were to recommend just one of her books as a place to start, which would you choose? Hah! I guess it’s not really a fair question, and you might answer it differently depending on who’s asking too, knowing different people’s reading preferences. Maybe I will just wait and see which one shows up as a nice and bright and shiny new paperback on the library shelves (but I will hope it’s The Ballroom!). I’m not so sure this sounds like one I would enjoy, but it certainly sounds unusual. I think you might. Did you read her first book?